If you have been arrested for Criminal Mischief it is important to retain a Stamford criminal defense attorney as soon as possible to protect your rights. This crime often occurs in several common situations, youthful pranks such as mailbox damage, egging houses and the like, highly intoxicated individuals who get into fights and it moves into the damage of property and finally in domestic violence cases where people get into heated arguments an start breaking things often in the home and sometimes damaging property such as vehicles in parking lots. There are some good defenses available to these charges however. In today’s world many homes, business and street intersections are equipped with video surveillance evidence which possibly could vindicate you. In many cases these video systems work on a time recording loop and will automatically record over the evidence if action is not taken to preserve the evidence. As explained at greater length below in the crime of criminal mischief often a key issue is one of “intent.” Often video evidence is one of the only sources of exculpatory proof which can negate the element of intent required to prove this crime. Instead of calling this crime “vandalism” which is what everyone would refer to it as, our Legislature decided to call this offense criminal mischief. At the same time they classified the more serious version of this offense as a felony so they obviously take this type of crime seriously. Often these kind of offenses may seem like minor child hood stunts and silly pranks but the State’s Attorney and the Court’s take criminal mischief charges seriously and they are misdemeanor or felony crimes which can have major future consequences upon your reputation and employment prospects, not to mention the possibility of being convicted as a felon and facing up to 5 years in jail and probation and fines. If you have been charged with criminal mischief you need to hire an experienced Stamford criminal defense lawyer to protect your liberty and defend your rights. Contact the Law Offices of Allan F. Friedman today 24/7 for your free initial consultation / case evaluation. While the crime of criminal mischief is treated as a very serious crime this crime is also required to be proven as an intentional action which requires that the State to prove that you had the specific intent to cause damage or destruction to property. If for example you accidentally caused damage to property you can’t be found guilty of criminal mischief. In those situations it might be difficult to infer that they had an intention to damage property and not just relief their full bladder. This is why often video surveillance tape evidence can prove exculpatory if it shows that whatever damage that occurred to any property was solely the result of an accident and not an intentional action. In many cases conclusively resolving this question in your favor can lead to the dismissal of the charges against you. Unless there was a witness or a video of the act itself often the only evidence we are left with is the actual damaged item itself which often is the ultimate evidence of the crime itself. 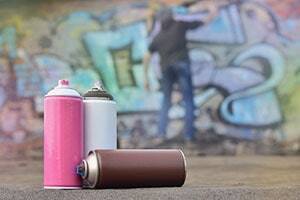 Remember the actual intention to destroy property is an essential element of the crime of criminal mischief. If you are facing the charge of criminal mischief you should contact us today for a detailed consultation so we can review all of the facts of your case and determine what defenses if any can be applied to get your case dismissed. For the crimes of First Degree C.G.S. Section 53a-115 and Second Degree C.G.S. Section 53a-116 criminal mischief the main distinction between these two crimes is the value of the property which has been damaged. Both of these statutes require a mental element of an intentional act to destroy property. The difference between the two is that criminal mischief in the first degree involves the destruction or damage to property in excess of $1,500 (or you intentionally interfere with or tamper with property belonging to a public utility, power, or telecommunications provider resulting in a service disruption. This crime is a felony for which you can face up to 5 years in jail and which would have a significant and profound impact upon your future including employment prospects and ability to find a place to live. On the other hand criminal mischief in the second degree involves damage to property valued at less than $1,500 and it is only a misdemeanor for which the maximum penalty is one year in jail and probation. Obviously, there is a huge difference for our clients between being charged with a felony level offense and a misdemeanor level offense. Top Stamford criminal defense lawyers will agree that often property owners will exaggerate the “estimates” of their damages when they are the victims of criminal mischief and that the Police and State’s Attorneys are not really going to spend a lot of time to scrutinize these claims for accuracy. When it comes it comes to lowering a felony allegation down to a misdemeanor level offense be assured that we are going to go over the victim’s proof of loss with a fine tooth comb to verify that it is truthful, accurate and represents a true and fair value to restore the damage back to its original condition. So you can see that especially in cases where the amount of the damaged property is at or near the $1,500 dollar mark we are always going to put a significant effort into disproving the State’s claim regarding the amount of the damages. Through years of experience we have found that in the investigation of criminal mischief cases Police will often accept very casual and informal estimations of the amount of the damages which would never stand up as evidence in a jury trial. Often taking the initiative to contact the victim of the criminal mischief and ascertain what their damages are and work to compensate them fully before your case comes to Court can score big dividends in terms of getting a favorable resolution from the State. There is nothing that the State’s Attorney likes better than a happy and whole victim and a proactive and remorseful defendant who accepts responsibility for his or her actions. For this reason when the victim is reasonable and not out “for blood” we try to work with them on your behalf and come to an accommodation about the amount of the damages and work to get their property fixed and hope that they will change their opinion about the case and actually become supporters of your position and assist you in seeking to have your charges dismissed or reduced. In many cases criminal mischief offenders are first time offenders. In some situations we are able to put together an effective mitigation package and help explain that the act in question was an aberration, this combined with full restitution up front to the victim will often be enough to convince the State to dismissed the charges in exchange for community service hours or a charitable donation. The fall back plan would be to use the Accelerated Rehabilitation Program. Please read by guide to the accelerated rehabilitation program here. Upon successful completion of the accelerated rehabilitation program all of the charges would be dismissed and you would have no criminal record so this is really an ideal resolution for these kind of cases. Due to the social stigma that goes along with having a criminal conviction for the crime of criminal mischief it is very important to have the charges dismissed as having a criminal record for criminal mischief can have long lasting and significant effects upon your future reputation and ability to secure employment. If you have been charged with a criminal mischief case you should speak with a Stamford criminal defense attorney as soon as possible to go over the all of the details of your arrest. With 25 years of experience in the defense of criminal allegations in Stamford , Attorney Allan F. Friedman can give you sound legal advice. Was your arrest lawful? Have your constitutional rights been violated? Our objective is to use every means possible to have the charges dismissed or thrown out, or significantly reduce the charges.